ADVANCED MOD MEDIA CARTRIDGES FILTER PARTICLES 3 TIMES FINER THAN SAND FOR CRYSTAL CLEAR WATER! Sta-Rite has combined the powerful filtering capabilities of a cartridge filter with the low-maintenance of a sand filter. Specially designed Mod Media cartridges will filter particles 3 times smaller than sand and require only a simple cleaning about 2 times per season. Now you can have the low maintenance of sand with the outstanding water clarity of a cartridge filter. This system comes with a high-tech tank that is compact and built of tough Dura-Glas composite to withstand weather and corrosion. It is backed by a 10-Year Warranty. The tank is also designed around easy access with its easy-open “posi" ring closure that allows rinse-in-place cleaning of the Mod Media cartridges. You can wash and rinse your Mod Media cartridges without even removing them! The Mod Media's filter is specially designed to handle 15 times more dirt than an equivalent sand or cartridge filter. It can handle so much dirt and continue to operate efficiently, that you will only have to rinse the cartridges once or twice per season. Plus, Mod Media cartridges last for many seasons, eliminating the hassle of replacing sand every other year. Driven by our powerful and efficient Sta-Rite pumps, the system produces optimal turnover rates. In fact, the system is so efficient you can run it less, saving you money on energy costs. The system comes complete with pump, filter, base, and hose connections. Invest in the premium Mod Media system this season for unsurpassed water quality and low, low maintenance. Sturdy handle & graceful curves make it a beautiful addition to any pool. Removable ballast keeps step in place, allows for easy winter put away without sandbags. 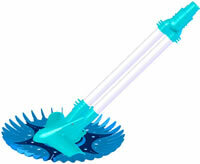 Manta Ray will clean any above ground pool regardless of shape or depth. With only one moving part, it will remove dirt, twigs, leaves and debris from your pool. It will free you from the chore of vacuuming! Since there is only one moving part, Manta Ray will give you years of maintenance free operation. 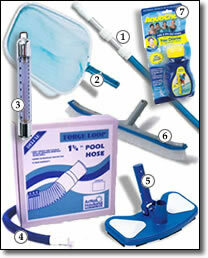 Simply plug the unit's hose into your skimmer and Manta Ray effortlessly cleans your pool. The unit is quick and easy to install and comes complete with 30' of hose. Backed by a 1 year warranty. End the drudgery of vacuuming this season with Manta Ray at this great price. . This quality winter cover features heavy duty woven polyethylene and heat sealed seams ensure that no dirt and debris enter your pool over the winter. Double-stitched seams, a vinyl-coated cable around the perimeter, and all-weather aluminum grommets with tighter ensure the cover stays put in windy conditions. Comes with a 4' overlap and a black underside to retard algae growth. Navy 8-Year Warranty (8 x 8 inner scrim) fabric. Our durable above-ground blankets can warm your pool this year by up to 15°F. Our blankets are made to give you maximum heating properties combined with long life. Our 8-mil blankets are loaded with thermal bubbles that retain heat at night and on cool cloudy days. Our transparent blue color allows the maximum amount of solar rays to reach you pool for optimal heating. All of our blankets are U.V.-protected so they last under the most intense sunlight. Built to last and backed by a 3-Year Warranty.